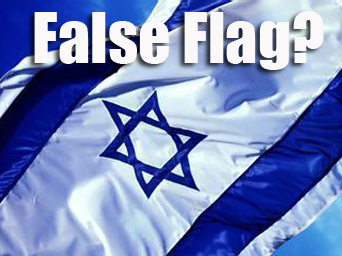 ARE WE WITNESSING A FALSE FLAG INTIFADA? During the past few days, eyewitnesses reported that Israeli security personnel actually fabricated several “stabbing incidents” in order to justify shooting and killing more Palestinians. 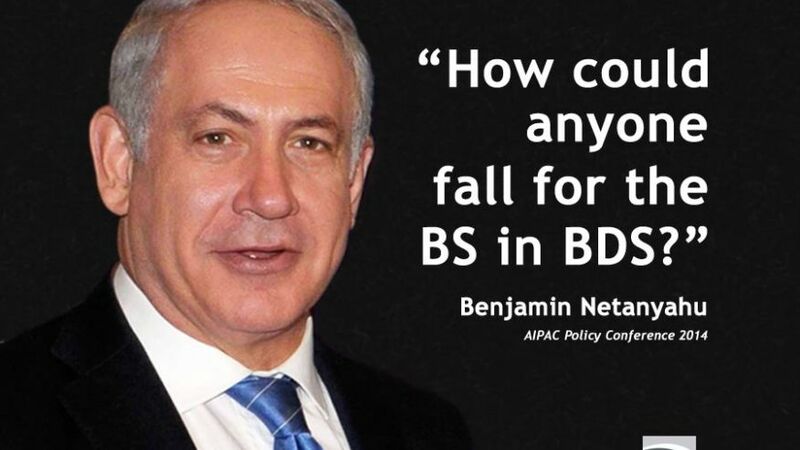 Israeli Prime Minister Binyamin Netanyahu has been lying rather brazenly in an effort to justify the summary execution of Palestinians suspected of trying to attack Israeli soldiers and settlers. “We are talking about totally innocent people who were just walking the street or crossing a pedestrian line or simply standing in the wrong place at the wrong time,” said Anwar Hamzeh, a human rights monitoring group in Ramallah. In another burst of what he usually does best, namely lying, Netanyahu claimed Israel was fighting what he called terror. As usual, he ignored the overwhelming terror by the Israeli state, its soldiers and settlers against unprotected and unarmed Palestinian civilians, like burning entire Palestinian families alive, shooting to kill rather indiscriminately on Palestinians innocuously hurling stones on heavily protected soldiers as happened near the security fence east of Gaza. There is only one word for this behavior: Murder, intentionally and premeditatedly. Netanyahu went further by proposing to cooperate with Jordan and Egypt. He carefully overlooked the clarion fact that the enduring Israeli occupation of Palestine and denial of its citizens the most basic human rights, including the right to life, is the root cause of violence and terror, not only in the Middle East but in much of the world as well. And in the past few years, Netanyahu introduced an additional incendiary provocation, namely recurrent efforts by fanatical Messianic Jews to take over the Aqsa Mosque, one of Islam’s holiest places under the sun. This extremely sensitive issue has always been and will continue to be a matter of life or death for the vast majority of the Palestinian people. I asked Sheikh Ikrema Sabri, the former Mufti of Palestine, to explain the gravity surrounding recurrent Israeli efforts to seize the Aqsa Mosque in order to build a Jewish temple on the mosque’s site. Needless to say, Netanyahu’s statement before the Knesset on Monday that Israel was ready and willing to cooperate with Amman and Cairo against terror constitutes a real insult to both the Jordanian and Egyptian regimes. In truth, Netanyahu, by offering to cooperate with regional powers against terror, actually wants Amman and Cairo to openly support Israel’s doomsday designs against the Aqsa Mosque as well as Israel’s ongoing crimes against Palestinian civilians. 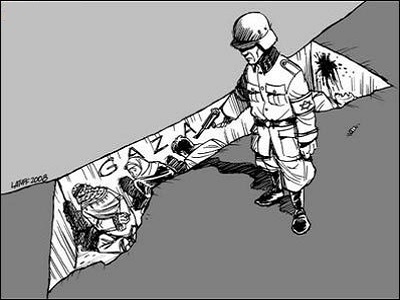 Israel has already killed any remaining realistic prospects for the establishment of a viable Palestinian state on the territories Israel occupied in 1967. 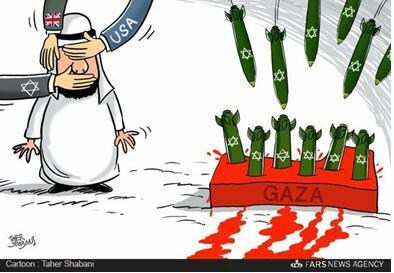 Now, Israel under Netanyahu wants to complete the “final solution” for the Palestinian question by getting some Arab regimes to endorse the liquidation of the Palestinian cause under the rubric of fighting terror. Is there a greater insult to Amman and Cairo than calling on the two Arab capitals to back Israel’s slow-motion holocaust against the Palestinian people? Idiot boy in the land of idiots! 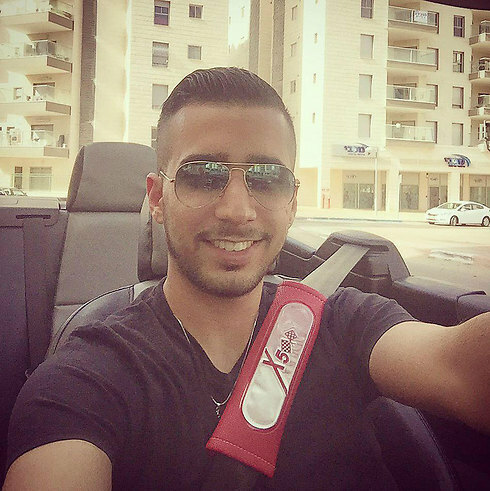 After Israeli security forces searched the Hebron area for him for 10 hours, 22-year-old Niv Asraf from Be’er Sheva, who was feared kidnapped, was found alive in Kiryat Arba on Friday overnight. IDF Spokesman Moti Almoz said Asraf’s soldier friend fabricated the kidnapping. Asraf was found in a wadi in Kiryat Arba with canned food and a sleeping bag, a Judea and Samaria Police spokesman said. “The ‘missing man’ and his friends staged a kidnapping. We’ll investigate the reasons behind this and will handle this to the full extent of the law,” the spokesman said. Israeli security forces were first alerted to Asraf’s disappearance when his friend called the police at 4:17 pm, saying he and Asraf were stranded with a flat tire on their way to pray at the Cave of the Patriarchs. The caller said Asraf went to find tools to replace the tire but never returned. However, when the IDF arrived at the scene, troops found no flat tires in the vehicle and after other questions arose from the friend’s story, he was taken for questioning. “At first the friend told us (Asraf) went in a particular direction, and then it turned out it was somewhere else, but it might not have been maliciously,” Almoz said. The two stopped their vehicle near HaOkfim Junction on Highway 60 between Bayt Einun and Hebron. Hundreds of policemen and soldiers from the IDF’s Judea and Samaria division were deployed to the area to search for Asraf, including Special Unit soldiers. The troops were searching houses and cars in Bayt Einun. Forces were searching the area between Halhul north of Hebron and Bani Na’im south of Hebron. The IDF also launched drones and observation balloons into the air to for a bird’s eye view of the area. The army closed roads around Bayt Einun on Highway 60 and Highway 35 as part of the search effort and declared the entire area a closed military zone. “His girlfriend broke up with him several days ago and there’s a possibility he’s doing it to provoke. I think he’s hiding somewhere and he’ll turn up somewhere in the end,” the friend added. After Asraf was found, IDF troops returned to their routine activity, while the investigation into the incident was passed on to the police. 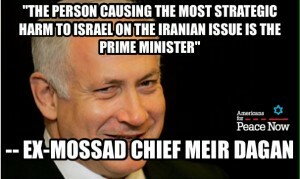 Israel is moderate and responsible? Prime Minister Binyamin Netanyahu has once again waved the red flag regarding the deal currently in discussion with Iran over its nuclear program. “The agreement being formulated in Lausanne sends a message that there is no price for aggression and on the contrary – that Iran’s aggression is to be rewarded,” the prime minister said in a statement at a ceremony honoring outstanding Prime Minister’s Office employees. “The moderate and responsible countries in the region, especially Israel and also many other countries, will be the first to be hurt by this agreement,” he added. “One cannot understand that when forces supported by Iran continue to conquer more ground in Yemen, in Lausanne they are closing their eyes to this aggression,” he said, referring to Tehran’s backing of Shia Houthi rebels. It comes as the P5+1 talks with Iran over its nuclear program go down to the wire, with just a day to go until the latest deadline on March 31. On Sunday, reports surfaced suggesting a provisional deal had been made with Iran, as all the negotiating teams sat for their first-ever joint session. Iran later denied those reports. Earlier Sunday Netanyahu had claimed the deal under discussion was even worse than he had feared. “The dangerous accord which is being negotiated in Lausanne confirms our concerns and even worse,” Netanyahu said in remarks at a meeting of his cabinet broadcast on public radio. “Even as meetings proceed on this dangerous agreement, Iran’s proxies in Yemen are overrunning large sections of that country and are attempting to seize control of the strategic Bab-el-Mandeb straits which would affect thenaval balance and the global oil supply. Defense Minister Moshe Yaalon also was quick to react to the disputed reports of a deal later that day, warning such an agreement, if true, would merely embolden Iran to be more aggressive. “A very bad deal could be signed in Switzerland with Iran, a country with a radical and out-of-control regime that succeeded in hoodwinking the entire western world,” he added. On March 3rd, Israeli Prime Minister Benjamin Netanyahu will address a joint session of Congress, where he is expected to make the case against a nuclear deal with Iran, at least a deal that could result from the current negotiations between Iran and the P5+1 (the U.S., France, Germany, the Russian Federation, the People’s Republic of China, and the United Kingdom). During this visit to Washington, Netanyahu will make other speeches and find other occasions to speak to the media in which he will no doubt, make the same case. In anticipation of these speeches and statements, it is important to “un-pack” and debunk the bogus arguments against an Iran deal that Netanyahu is most likely to be making. The eleven most prominent of those arguments are examined here. The full document can be printed/downloaded here. Additional sanctions and credible threats of military action can secure a better deal with Iran than current negotiations. Decades of U.S. sanctions targeting the Iranian regime failed to achieve the goal of either compelling that regime to give up its nuclear program or causing it to fall. Likewise, years of U.S. sanctions targeting the Iranian people have failed to achieve the goal of mobilizing Iranians to either force their government to change course or to overthrow it and replace it with a more pro-West alternative. In recent years, multilateral, international sanctions have contributed to convincing the Iranian government to come to the negotiating table and offer real compromises with respect to its nuclear program. More U.S. sanctions today are far more likely to result in Iran’s abandoning the negotiating table than to result in Iran suddenly becoming amenable to a purported “better” deal – i.e., one involving elements that no Iranian regime would ever accept. In such a case, it would be the U.S., not Iran, that would likely be blamed for the collapse of talks, leading to an erosion of international consensus on Iran sanctions that undermines the existing sanctions regime without achieving tangible Iranian compromises in return. In such a case, Iranian hardliners who oppose any compromise with the West would be strengthened, with new U.S. sanctions and the collapse of talks bolstering the argument that the U.S. and its allies are not truly interested in a deal, but want regime change. In such circumstances, it is far more likely that Iranian leaders will conclude that the urgent development of Iranian nuclear weapons is a necessary deterrent against such attack. The only good deal with Iran is one that leaves Iran with zero enrichment capacity. Zero enrichment – the demand that not a single centrifuge is left spinning in Iran – is neither an achievable nor a necessary goal of negotiations. It’s not achievable because just as P5+1 negotiators must get a deal they can “sell” to their constituencies, Iranian negotiators must be able to sell a deal to their own constituencies as meeting their own red lines (most notably, sufficient capacity for legitimate domestic energy production and legitimate R&D purposes, preserving what Iran views as a sovereign right to enrich, and assuring that Iranian pride in the nation’s scientific advances is left intact). It’s not necessary because assuming “zero enrichment” is genuinely shorthand for “the best possible guarantee that Iran’s nuclear program will remain peaceful,” this goal can be achieved through a nuclear agreement that includes strict limits on Iran’s enrichment capacity and stringent safeguards and transparency with respect to Iran’s nuclear facilities and materials. Insisting on “zero enrichment” guarantees that such limits and safeguards are absent. Demands for zero enrichment as a condition for a deal are tantamount to rejecting any agreed-upon, negotiated solution with Iran. Alternatives offered by advocates of a zero-enrichment red-line consist of fantasy and wishful thinking (“more pressure and Iran’s government will give in or be overthrown) and war-mongering (“military action can remove the threat of a nuclear Iran”). Both approaches would likely exacerbate, rather than curb, the Iranian nuclear threat. Any deal with Iran is a bad deal, because the mullahs can’t be trusted. A nuclear deal with Iran would be grounded in ongoing rigorous inspections and verification mechanisms – not trust. It is those rigorous inspections and verification mechanisms that would ensure that Iran lived up to its end of a deal. Should Iran interfere with those inspections and verification mechanisms, or should those inspections and verification mechanisms reveal Iranian malfeasance, the international community would know immediately and have ample opportunity to prepare its response. Without an agreement, those rigorous inspections and verification mechanisms would be absent. The international community, recognizing that Iran cannot be trusted, would be left to worry and try to come up with policies and actions based on incomplete information. Even with an agreement in place, the U.S. and international community will doubtless prepare and maintain contingency plans to address the possibility that Iran will renege on the deal – including planning for military action. It would be wrong to make any nuclear deal with Iran unless that deal also held Iran accountable for its support for terrorism and extremism, in the region and beyond. Achieving and implementing an agreement acceptable both to the P5+1 and Iran will require that some sanctions imposed on Iran – sanctions imposed as a direct consequence of concerns about Iran’s nuclear program – be removed. However, an Iran nuclear deal would not change U.S. policy or impact U.S. sanctions with respect to Iran’s support for terrorism. U.S. anti-terrorism legislation is for the most part separate from Iran nuclear legislation; anti-terrorist provisions that apply to countries around the world would continue to apply equally to Iran, even with a nuclear deal in place. A nuclear deal with Iran could, potentially, open the door for improved U.S.-Iran relations – relations – which could eventually lead to improvements in other areas of concern to the U.S., including concerns linked to Iran’s support for terrorist organizations. Those seeking to derail Iran talks or scuttle a nuclear deal with demands related to other issues are sending a message that their true goal is not mitigating the threat of a nuclear-armed Iran, but regime change in Iran. Such a message will likely strengthen hardliners, increasing the threat that Iran will indeed seek to acquire nuclear weapons and worsening Iranian behavior in the other spheres, including with respect to support for terrorism outside Iran’s borders. It would be wrong to make any nuclear deal with Iran unless that deal also held Iran accountable for its terrible record with respect to human rights and civil liberties inside Iran. An Iran nuclear deal would not change U.S. policy or impact U.S. sanctions with respect to Iran’s record on human rights abuses, democracy, or other non-nuclear-related matters. By improving the conditions of Iranians overall, an Iran nuclear deal could strengthen domestic groups engaged in promoting human rights and civil liberties. It could also strengthen Iranian political forces that are more open to change. For these reasons, a nuclear deal is widely supported by human rights and democracy advocates within Iran. The failure of Iran diplomacy – and what this failure would mean in terms of discrediting some of Iran’s more moderate political voices – could open the door to greater repression domestically. A deal with Iran over its nuclear program will only strengthen and enrich an odious, extremist regime, and in doing so increase the threat of extremists everywhere. The U.S. and its P5+1 partners are pursuing a nuclear agreement with Iran not as a gift to Iran, but because curtailing the threat of a nuclear-armed Iran is in the vital interests of the U.S. and the international community, including Israel. A deal with Iran over its nuclear program would in no way imply U.S. approval for Iranian policies or acquiescence to Iranian bad behavior in any sphere. A deal likewise would in no way limit the ability of the U.S. and the international community to criticize or pressure Iran – just like any other country. Derailing talks or undermining a deal with Iran over its nuclear program will only strengthen those in Iran who believe that the West will not be satisfied with anything short of the overthrow of the current regime, and who view the militarization of Iran’s nuclear program as necessary to deter an attack. One-year “breakout” time for Iran to become a nuclear state is way too short. If Iran decides to dash to get a bomb, it will already be too late. “Breakout” time does NOT refer to the time required for Iran to become a nuclear-armed state. It refers only to the time needed for Iran to produce enough weapons-grade uranium to fuel a single nuclear bomb. To represent a threat as a nuclear-armed state, Iran would first have to produce sufficient weapons-grade uranium to fuel at least two bombs – one to test (to prove its nuclear capabilities) and the other to hold as a deterrent against retaliation. It would also have to build both bombs, build a working delivery system, and carry out a test. An agreement would impede Iran’s ability to “dash” to become a nuclear-armed state by extending “breakout” time from the current 2-3 months to at least one year. It would achieve this by prohibiting Iran from enriching uranium to a level (20%) at which it could be converted into weapons-grade uranium, and by imposing limits on the number and type of centrifuges Iran would be permitted to operate, as well as on the size of Iran’s stockpile of enriched uranium. An agreement would also impede any future Iranian nuclear weapons “dash” by extending the time required for Iran to build actual bombs and a delivery system. It would achieve this by imposing international oversight and inspections that would diminish, in an unprecedented way, Iran’s ability to pursue nuclear activities with potential military dimensions, even covertly. Absent an agreement, there will be no limits on Iran’s ability to build up its stockpile of enriched uranium. Absent an agreement, the U.S. and international community will revert to the longstanding status quo in which they have extremely limited and often imperfect information about what is going on inside Iran’s nuclear program. Should Iran renege on a nuclear deal and pursue weaponization, a one-year “breakout” time ensures that the U.S. and the international community would have ample time and opportunity to respond. The real issue isn’t “breakout” but “sneak-out.” It doesn’t matter how many limits or safeguards you put into place – Iran will cheat and we will wake up one day to find Iran armed with nuclear bombs. “Sneak-out” is a danger with or without an agreement. An agreement will put into place inspection, oversight and verification mechanisms – with respect to facilities, equipment and supplies – that ensure that a “sneak-out” would be far more difficult for Iran to achieve and far more likely to be detected. Without an agreement, these inspection, oversight and verification mechanisms will not be implemented, ensuring that any “sneak-out” effort would be far more likely to go undetected. The current negotiations are leaving in place too many Iranian centrifuges. The more centrifuges left spinning, the greater the threat Iran poses. Viewed in isolation, the number of centrifuges Iran is allowed to operate under an agreement does not provide a clear measure of breakout time. It thus fails to adequately calculate the threat Iran would pose should it renege on a nuclear deal and shift to a militarized nuclear program. To truly measure this threat requires examining the number of centrifuges, the types of centrifuges, and the size of Iran’s stockpile of enriched uranium under an agreement. Consistent with the interim deal that gave birth to the current negotiations, Iran has already eliminated its stockpile of 20 percent enriched uranium gas – the feedstock required to produce weapons grade uranium. By doing so, the immediate threat of Iranian “breakout” has been dramatically reduced by, in effect, emptying the cartoon bomb that Israeli Prime Minister Netanyahu displayed at the UN in 2014. A nuclear deal with the P5+1 can be expected to significantly reduce and cap the number of centrifuges spinning in Iran. 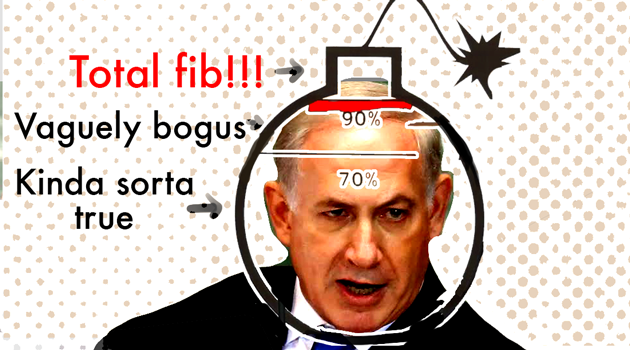 A deal likewise can be expected to limit the type of centrifuges left spinning and to limit Iranian enrichment, such that Netanyahu’s cartoon bomb will not be refilled and such that weapons-grade uranium remains out-of-reach. Without an agreement, the number of Iran’s centrifuges can be expected to grow, and the level at which uranium will be enriched can be expected to return to 20 percent, or go even higher. A nuclear deal with Iran will leave Iran as a threat to the world and an existential threat to Israel, will sell out our allies in the Gulf, and will fuel a nuclear arms race in the region. The prospect of Iran armed with nuclear weapons is indeed alarming, particularly to Israel, which exists in close proximity to Iran and which has over the years been the target of harsh threats from various Iranian political and religious figures. It is also alarming to many countries in the Middle East, who see Iran as seeking regional dominance and meddling in their affairs. Neither diplomacy nor military action can guarantee that Iran will not someday decide to pursue nuclear weapons. Iran long ago acquired the knowledge and expertise to do so. International pressure and sanctions have impeded Iran’s nuclear program for years, but more importantly, leaders in Iran today have decided not to pursue an active nuclear weapons program. A negotiated deal can bolster this decision, while further rolling back Iran’s nuclear capacity such that if Iran’s leaders someday have a change of heart, the U.S. and international community – including our friends and allies in the region – will have ample time and opportunity to take action. A negotiated deal with Iran would not imply U.S. endorsement of Iranian bad behavior elsewhere in the region, nor would it imply that the U.S. was abandoning traditional allies in favor of warmer ties with Iran. Rejecting a negotiated deal out-of-hand in favor of hardline demands for the complete eradication of Iran’s nuclear capacity is virtually guaranteed to have the oppose effect. Making the complete elimination of any Iranian nuclear capacity the end goal of U.S. policy is tantamount to demanding that the U.S. go to war, and is likely to strengthen those in Iran who view the acquisition of nuclear weapons as necessary to deter such military action. Such a policy would, in fact, be far more likely to fuel regional instability and an arms race than a negotiated deal would. A deal that “sunsets” after 10 or 15 years is no good – it just means that Iran will wait and ready itself and then go nuclear the minute a deal ends. Just as there is no possibility of a “zero enrichment” deal with Iran, there is no possibility of Iran agreeing to a “permanent” deal on its nuclear program. Iran is in trouble right now because it has repeatedly violated the Treaty on the Non-Proliferation of Nuclear Weapons (NPT), resulting in sanctions. Negotiations over Iran’s nuclear program are grounded in the understanding that by demonstrating compliance with all of its NPT obligations, Iran will no longer be in violation of the NPT and Iran’s tenure in the international doghouse – at least with respect to its nuclear program – can come to a close (at least so long as Iran remains in compliance). An Iran nuclear agreement – whether its provisions are in place for 10 years, or 15 years, or however many years are agreed on – would dramatically mitigate the threat of Iran acquiring nuclear weapons. For the period of the deal, the agreement would dramatically curtail Iran’s nuclear program, extending breakout time from a couple of months to a year, making it much harder for Iran to shift course and making the path to weaponization far longer than it would be without an agreement. At the time that an agreement sunsets (and different provisions would likely sunset at different times), Iran would still remain a member of the NPT and subject to the requirements of that treaty. Iran would also remain bound by an Additional Protocol to the treaty, granting UN inspectors greater authority in monitoring Iran’s nuclear program. Following a decade or more of intrusive inspections and other oversight mechanisms, the U.S. and international community would at that time also be in a far stronger position to judge Iran’s actions and intentions vis-à-vis its nuclear program than they would have been without a deal. If, subsequent to a deal “sunsetting,” they determine that Iran’s leaders are shifting course and pursuing weaponization, the U.S. and international community will have ample time and opportunity to take action – and their decisions at that time will benefit from more than a decade of insights into Iran’s nuclear program and more than a decade of improved planning based on those insights. Optimally, by the time a deal sunsets Iran would recognize the tangible benefits of continued curtailment of its nuclear program – benefits that would be imperiled if, in the period after an agreement “sunsets,” Iran decided to shift course and pursue weaponization of its nuclear program. The only people who can stop the transformation of anti-Israelism into anti-Semitism gathering momentum are the Jews themselves, with those who are citizens of the European nations and America taking the lead. There will always be some Jew haters and Nazi holocaust deniers. So what I mean when I say the sleeping giant of anti-Semitism might well have died in its sleep is that it would not have come back to life again as a force capable of seriously threatening the well being and security of the Jews. In my view Rabbis Sacks and Miller and all who think like them are in complete denial of the link between Israel’s actions which sometimes amount to state terrorism and the transformation of anti-Israelism into anti-Semitism. What this link is was put into words more than a quarter of a century ago by Yehoshafat Harkabi, a long-serving Director of Israeli Military Intelligence. (I have quoted his warning in several of my previous posts but what he wrote bears repeating, again and again and again). In his book Israel’s Fateful Hour, which contained his call for Israel to withdraw from the occupied territories, and his statement that the biggest real threat to Israel is its self-righteousness, he wrote the following. Another way of saying that an ancient hatred has been reborn is that what used to be called the “sleeping giant” of anti-Semitism is waking up. Putting it that way makes understanding possible and here’s why. After the Nazi holocaust, and because of it, this giant went back to sleep and might well have died in its sleep if Zionism had not been allowed by the major powers to have its way and Israel had been required to be serious about peace on the basis of an acceptable amount of justice for the Palestinians and security for all. To avoid being misunderstood I must qualify that statement. There will always be some Jew haters and Nazi holocaust deniers. So what I mean when I say the sleeping giant of anti-Semitism might well have died in its sleep is that it would not have come back to life again as a force capable of seriously threatening the wellbeing and security of the Jews. The evidence which gives great weight to that analysis can be obtained from just a few moments of reflection about the history of the whole of the second half of the 20th century and much if not all of the first decade of the 21st. What stands out with regard to the Jews is the wellbeing of those who were/are citizens of the Western nations. They were not only secure, they had influence in political, economic and many other spheres out of all proportion to their numbers. (Which is why, generally speaking, I have always regarded the Jews as the intellectual elite of the Western world. And that in turn is why I am amazed that most Jews allowed themselves to be brainwashed by Zionist propaganda and are beyond reason on the matter of justice for the Palestinians as a consequence). It was Israel’s “misconduct” (what a charming Harkabi euphemism for defiance of international law, on-going colonization and ethnic cleansing by stealth!) that set in motion the rising, global tide of anti-Israelism which, as he warned, is showing signs of a creeping transformation into anti-Semitism. Put another way, it was Israel’s policies and actions which guaranteed that the sleeping giant would not die in its sleep and would wake up to go on the prowl again. Short answer – by declaring that Israel does not speak for or represent them and that they condemn its defiance of international law and denial of justice for the Palestinians. If they don’t do that there will most likely be a final Zionist ethnic cleansing of Palestine followed at some point by a wide awake giant of anti-Semitism going on the rampage again. But we should not forget what France, the first European country to bestow full legal rights on Jews, still offers them: vibrant Jewish institutions and a government that sees their presence as integral to the French future. The French president and prime minister, along with the mayor of Paris, have been steadfast in their support of Jews on French soil. (JTA) — Three weeks ago, my wife and I were shopping in a Parisian kosher butcher store several miles west of the supermarket where four Jews were murdered on Jan. 9. The shop in our neighborhood was well patronized, with lines stretching out to the sidewalk before Shabbat. We were staying in an apartment in Paris’ 12th district while I promoted a new book about the treatment of Jews in France during World War II. During our stay, we spoke with dozens of our Parisian friends, including some who are Jewish, about whether the year 2015 evokes for them at least some of that dark anti-Semitic history. It was a time when a French government that became known as Vichy promulgated 200 anti-Semitic laws — with little German pressure — that eventually sent some 75,000 Jews “to the East” and almost certain death in the concentration camps. In those weeks of what we now know was the “calm before the storm,” our friends confessed to some fears about a combined resurgence of both old and new forms of anti-Semitism in France. The far-right National Front party under Marine Le Pen barely hid its old-style anti-Semitism under the ugly mask of anti-Arab xenophobia. And the party was gaining strength in the polls. Meanwhile, individual Jews were sporadically attacked, frequently by disaffected French Muslims. In some areas of Paris, one friend said, it might be unwise to wear a yarmulke outdoors. But in their own neighborhood, in the 15th district, they said they would have no such fears and did not counsel their nephew, an observant Jew in his 20s, against wearing a kippah. In fact, a cross-section of my Parisian friends agreed that American talk of France having become anti-Semitic was grossly exaggerated. So in polite conversations back in the States, my wife (a French teacher in Manhattan) and I had already noted what we felt were overstatements, given our own experiences and observations during frequent visits in various parts of France. We chalked up some of the feverish American talk to the persistent Francophobia that too often marks political commentary about France in the United States. The French, after all, have long been targeted for American criticism. We tried to curb this talk of French anti-Semitism, the supposed droves who were leaving for Israel — some 7,000 French Jews in a population of approximately 500,000 made the move last year, though some have since returned for economic and other reasons — and what we knew were exaggerated American images of French Jews living in constant fear. We did this, recognizing that Europe is perennially at some risk of returning to its traditional anti-Semitism — a risk I consider more fundamental even than Muslim extremism fueled by events in the Middle East. My attitude about France has not changed even since the latest spate of deadly violence. There is nowhere in the world that is safe. But in many ways it is as safe for Jews in Paris as it is in Tel Aviv or Brooklyn, or Budapest. 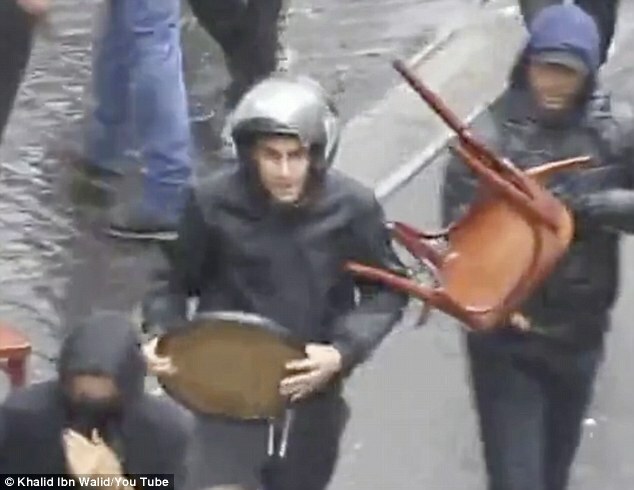 Of course the prudent increase in security, as long as it does not turn France into a police state, will be necessary for a while, as it has been periodically for the past few decades. French schoolchildren need to be protected (and, truthfully, the same could be said for American kids). The kosher butcher shop we patronized now is on high alert. This makes sense. During my recent trip, we saw a performance at a 100-seat theater of a French version of Shakespeare’s “The Merchant of Venice.” The audience, a broad cross-section of ordinary Parisians, seemed immensely sympathetic to the plight of Shylock the Jew as a representative of the persecuted European “other” through the centuries. 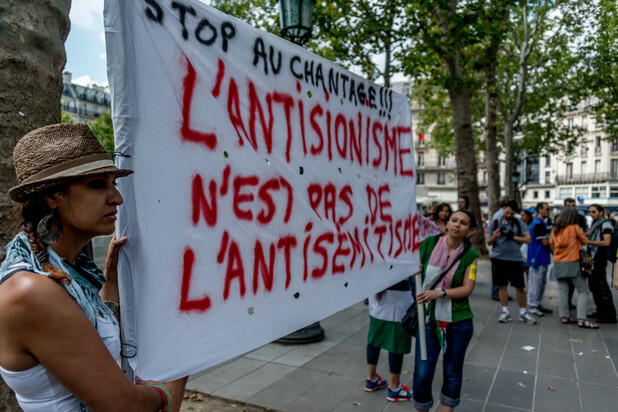 Attitudes toward Jews are changing for the better in France. There will be tragic eruptions to the contrary. But France is not an anti-Semitic country. It remains, as it finally comes to grips with its Vichy past, a bastion of equality and hope for its Jewish population. *Richard H. Weisberg is Floersheimer Professor of Constitutional Law at the Cardozo Law School of Yeshiva University. For his work in righting some of Vichy’s wrongs, he won the Legion of Honor in 2009. His recent book, “In Praise of Intransigence,” and his “Vichy Law and the Holocaust in France” both discuss French anti-Semitism. (Update: Israeli media are reporting that Netanyahu gatecrashed the march, defying a request from French President François Hollande that he stay away –– more below). Rabbi Menachem Margolin, the director of the European Jewish Association, described byHaaretz as “the largest advocate for the Jewish organizations and communities in Europe,” sharply criticized Netanyahu’s latest exhortations on Jews to abandon France. 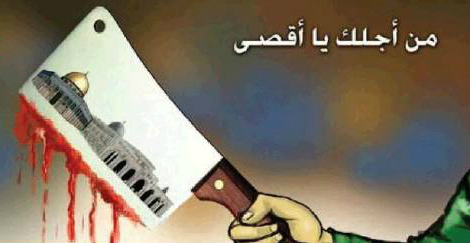 It included this screenshot from the Facebook page of the Palestinian publicationAlresalah. “It’s very good,” he said, hoping that the unfolding horror in New York, Washington, DC, and Pennsylvania would “generate immediate sympathy” for Israel. Since the brutal attack at the offices of Charlie Hebdo there have been vigils throughout the world simply stating ‘I AM CHARLIE’. 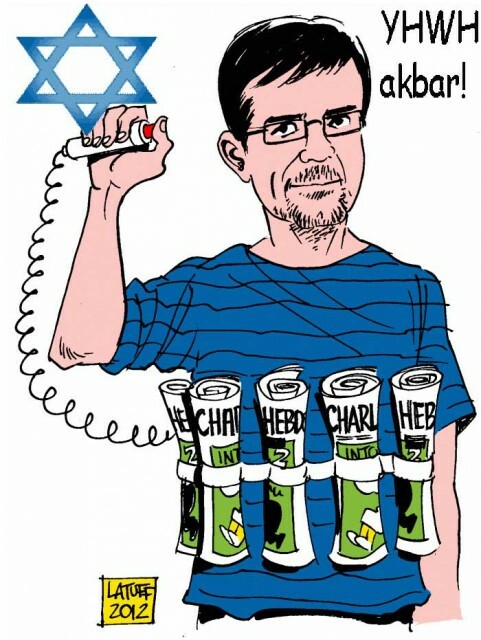 That one of those murdered happened to be a Jewish ‘cartoonist’ gave call to the zionists to pull their anti-Semite card and raise the false flag to the top of the pole as can be seen HERE. Satire is meant to be funny, not hateful. Mad Magazine has kept us laughing for decades and never has there been an attack at their offices. 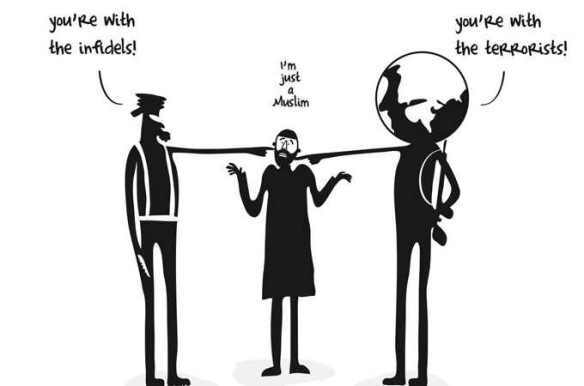 Charlie Hebdo has a history of offending people, especially Muslims. There is definitely nothing funny about hatred or racism. I am one of many that state without hesitation that I AM NOT CHARLIE! There is no “but” about what happened at Charlie Hebdo. Some people published some cartoons, and some other people killed them for it. Words and pictures can be beautiful or vile, pleasing or enraging, inspiring or offensive; but they exist on a different plane from physical violence, whether you want to call that plane spirit or imagination or culture, and to meet them with violence is an offense against the spirit and imagination and culture that distinguish humans. Nothing mitigates this monstrosity. There will be time to analyze why the killers did it, time to parse their backgrounds, their ideologies, their beliefs, time for sociologists and psychologists to add to understanding. There will be explanations, and the explanations will be important, but explanations aren’t the same as excuses. Words don’t kill, they must not be met by killing, and they will not make the killers’ culpability go away. The release does not mention the number of Jews who left Israel during the year for Europe, North America and other places which they deem preferable to live – an estimatedone million Israelis live abroad. It’s so unnecessary by now, but here I go anyway: Anyone who believes anti-Zionism is anything but a form of anti-Semitism is delusional. Two months ago I posted the following ….. Emphasis on Critics charge that it aims to portray the Arab and Muslim world in a negative light, through the production and dissemination of inaccurate translations and by selectively translating views of extremists while deemphasizing or ignoring mainstream opinions. Consider me one of those ‘critics’! MEMRI’s work directly supports fighting the U.S. War on Terror. Highly trained staff thoroughly translate and analyze open-source materials that include television programming, radio, newspapers, textbooks, and websites. This video takes you from the halls of government to the briefing rooms of the U.S. military to the frontlines of counter-terrorism efforts, and demonstrates just how MEMRI has become – A Vital Component in the U.S. War on Terror. They even operate their own TV Network …. The Palestinian Authority often broadcasts clips on their own TV Network in their attempt to justify the occupation and ethnic cleansing policies of their zionist brothers. Regarding a recent video clip, British zionists are campaigning with it in an attempt to discourage a YES Vote in Parliament as to whether or not recognise a Palestinian State. It is sentiments like these that persist not just throughout Hamas but throughout the more respected Palestinian Authority of Mahmoud Abbas. Here is a clip that was broadcast on Palestinian Authority television in which the PA Mufti of Jerusalem Muhammad Hussein urges his followers to kill Jews. Could we expect a combination of the CIA and Mossad to portray the honest aspirations of the Palestinian people? Hope you noticed that none of those passing by stopped to listen to this guy. Apparently their video didn’t reach the audience they were hoping for …. (only 30,847 viewers) so they are trying again in desperation. Tens of Arabs can be seen sitting or standing, watching the preacher. 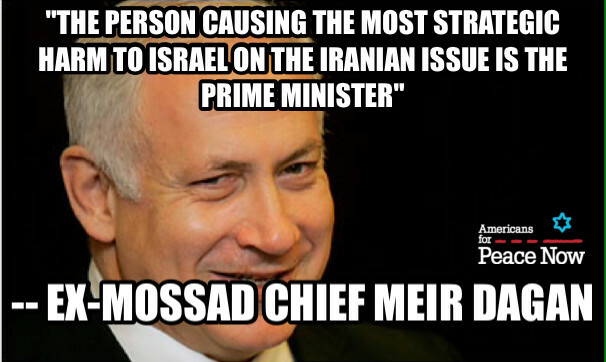 At least that’s what the zionists want you to believe …. none of the following was reported in the Palestinian press leading me to believe that the ‘terrorists’ behind this are actually the zionists themselves. The zionists have an ‘army’ of hackers who monitor pro Palestinian sites and render them ‘offline’ via DOS Attacks or other methods. My question is why have the sites reported about below not been targeted? Again, in my opinion, the answer is obvious. 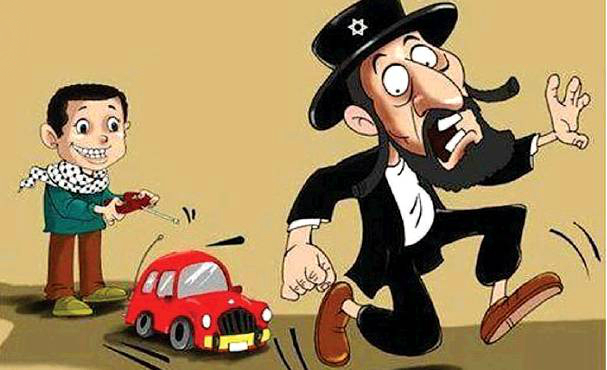 Palestinians are taking to social media encouraging a car intifada against Israel. The younger generation of Palestinians has learned well from Islamic State’s staggering success when it comes to sowing the seeds of fear, and has moved the focus of its resistance to the social networks. The blogger has joined forces with the muezzin; the talkbackers are in cahoots with the stone-throwers; and the “share” buttons are working alongside the incitement leaflets. The social network is the new mosque, and there’s no need to remove one’s shoes when entering; there are Border Police and there’s no tear gas; and the police don’t impose an age restriction on worshipers. With little oversight, Palestinian extremists are recruiting online and publishing unfettered propaganda; the effects are already been felt on the ground in the form of a spate of recent ‘lone wolf’ terror attacks. 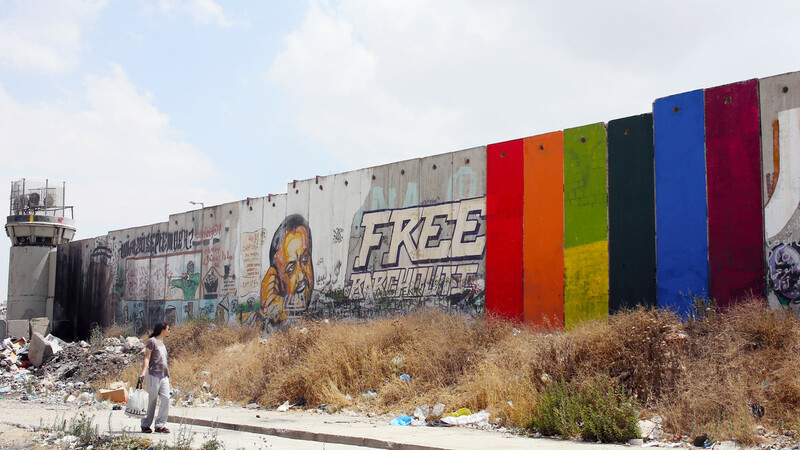 Everyone’s looking for the third intifada out on the streets, but it’s not only there; it has active and threatening offshoots on the Internet too. In recent months, this protected expanse has allowed the Palestinians to establish a new terrorist infrastructure. Instead of recruiting activists on the ground and worrying about them getting picked up on the radar of the Shin Bet security service, they’ve moved over to online recruitment via popular campaigns designed to sow hatred and covey the sense that the Al-Aqsa Mosque is under threat – in the hope of prompting a terror mission carried out by a lone attacker, one who is not affiliated with any terrorist organization. Online Palestinian incitement, referring to the recent terror attack at a Jerusalem synagogue and the purported threat to the al-Aqsa mosque. 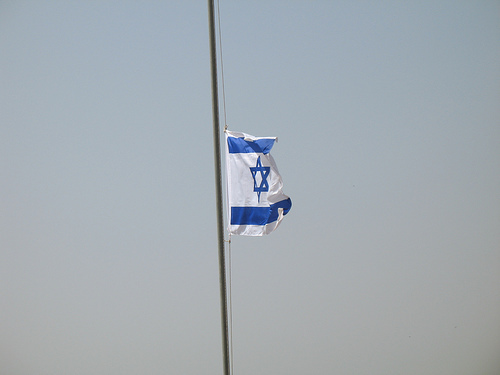 Such was the case with the recent terror attacks in Jerusalem; and such was the case, too, with the death of the construction worker in Petah Tikva in September. We’re no longer dealing with a wave of religious suicide attackers who are waiting to be received by 72 virgins. The new martyrs fall on the network, and get flooded with Likes. 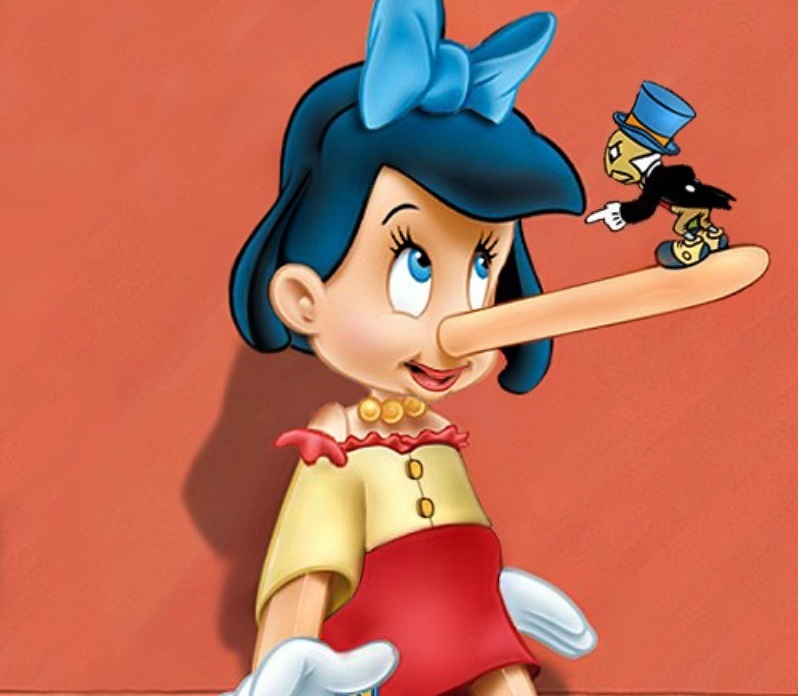 Orit Perlov, a social media analyst at the Institute for National Security Studies (INSS) who monitors and analyzes the discourse on the social networks in Arab states, says that the Palestinian Internet is currently running a number of incitement campaigns at the same time. “One of the leading campaigns calls for running down Jews with vehicles,” Perlov says. “It uses the word, ‘Idaas,’ which is ‘run down’ in Arabic, alongside a picture of a car running down ultra-Orthodox Jews. Immediately after the shooting of Yehuda Glick, the networks began a more focused campaign that called for running down Knesset members who have encouraged pilgrimages to the Temple Mount. Who posts this kind of material? Who’s behind it? Gilad Shiloach, a network analyst who works at the American news website, Vocativ, which monitors social network activity, says that Palestinian Web users respond quickly to developments on the ground. Such was the case, for example, in the affair of the dead Egged bus driver, Yusuf al-Ramouni, who Israel determined had committed suicide, whereas his family claims he was murdered. Prof. Yair Amichai-Hamburger, the director of the Research Center for Internet Psychology at the Interdisciplinary Center’s School of Communication in Herzliya, explains that the discourse on the Internet functions as a breeding ground for extremists. What does he experience there? “The propaganda is absolute. We are perceived there as Satan’s earthly representatives, who can take on the form of a Border Policeman, a 25-year-old woman or a baby of a few months. For him, every Jew represents a part of the threatening mechanism. 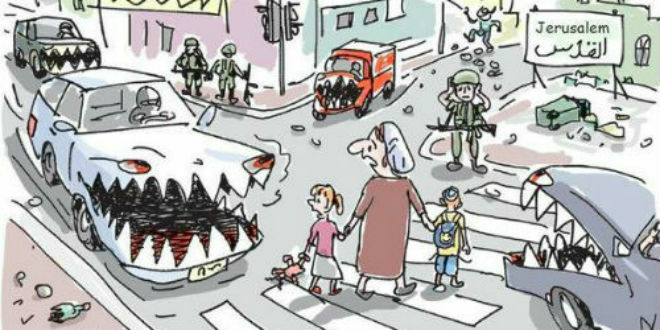 Online poster refers to recent vehicular terror attacks in Jerusalem. For many in Israel, up until a month or so ago, Yehuda Glick was an unknown figure; but he’s been a target on the Facebook pages of Palestinian activists for the past two years. “You’ll be dead soon,” said the caption alongside his picture on pages that dealt with visits by Jews to the Temple Mount. Glick complained, but nothing was done; and one Internet surfer who internalized the message eventually shot him. Today, the social networks are carrying calls for another attempt on the life of the right-wing activist. Glick now has bodyguards, and the same goes for others associated with efforts to visit the Temple Mount and who also star on the social networks; but the big question is can the Shin Bet foil the plans of the next terrorist – a terrorist who doesn’t yet know he is one. Daniel Cohen, an expert in cyber terrorism at the INSS, names Hamas as one of these organizations. “The organization is trying to join the masses and to encourage the lone perpetrator by means of incitement campaigns,” Cohen says. Despite the fact that the defense establishment has little chance of laying its hands on the lone terrorist, it still sees value in monitoring the social media sites – digging through the Facebook statuses and Twitter messages can at least offer an understanding of the mood among the Palestinians in the territories. “There’s something called ‘public intelligence’ – intelligence that is gathered with the purpose of studying the public,” explains an Israel Defense Forces intelligence officer. “The bottom line is that we want to have our finger on the pulse of the Palestinian public; and in the age of the social media networks, you can’t not add this piece of the puzzle to the picture. While the IDF merely monitors the Palestinian social media sites without actually taking any action against the incitement campaigns and the like, the Palestinian Authority adopts a more active approach, shutting down Facebook pages and conducting arrests when efforts are made to organize and affect change on the ground. Just in case you were wondering, Israelis are no saints either. 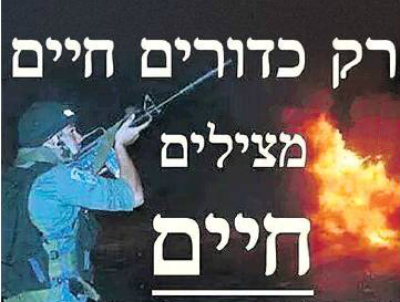 “Only live ammunition saves lives,” “Jews, revenge,” “Arabs are murdering you,” “Enemies aren’t given jobs” – these are just a few examples from numerous incitement campaigns that have appeared in recent months on the social network sites in Israel. The Jewish public has not sat by idly and has also reached the Internet boiling point. It happened this week with regard to the deliberations on the proposed Nationality Law, after the attacks in Jerusalem, during the 50 days of Protective Edge, and at the time of the search for the three teenagers who were abducted in Gush Etzion. And while the Israeli public isn’t swept along to the same extent as the Palestinian public, we are seeing racist and provocative campaigns on the part of right-wing groups, threats against the left, and the undermining of fundamental values of a democratic state. It turns out that this open expanse is actually closing the most mouths. “If radical right-wing groups were once on the margins of the margins of the Israeli public, hidden deep on the Net, the opinions of such organizations today have become legitimate,” Shiloach says. Israeli extremist online propaganda. The caption reads: Only live bullets save lives. Facebook has shut down a number of your pages because of content you have posted. “We had 40,000 members on the Lehava page; we’re now at 23,000 and I assume this page will also be closed down in the next week or two,” Gopstein says. “We’ll open a new one. The more they torture us, the bigger we will grow.